Let’s just get straight to it. I am not making any of my Christmas gifts this year (gasp!). How could this be?! Well, if you follow the blog with regularity, than you know this past fall I have not been regularly updating. I’ve started a new job and as these things go, I have been all consumed by it. Around mid-November I started thinking about Christmas presents and any crafter knows there are two choices for homemade gifts. A) You start early, you feel smug and you end up working like a mad person making sure to finish up all those Christmas gifts you intended to make. Or B) You start “late” (even December 1st is late for the homemade route) and you end up working like a mad person to make sure it is all finished on time. I love homemade gifts, but I am not one of those people who pretend like I just whipped something up in no time, when in fact coming up with the idea, gathering the supplies and making the thing actually took hours. That’s part of the heart of the homemade gift, the thought and time. This year I took stock of the situation. I knew the job stress would not have eased up by mid-December and if I went the homemade route I would be coming home from work and doing things like spending hours on the couch knitting my brother a homemade skinny tie. Yes, he is getting that as a gift one of these days. It’s a bit painful to decide not to go homemade, but it was also a relief this year. You get gifts for people you love a lot. Which means you get gifts for people who likely know what’s going on in your day to day life. Which means all the people who are use to getting homemade gifts from you, will totally understand without you having to say why you bought them something this year. And who knows, perhaps they might be a little bit excited they won’t have to wear your hand knitted tie (I kid!). But of course, gifts still need to be wrapped. What could possibly be more fitting this year than putting gold dots on my gifts. 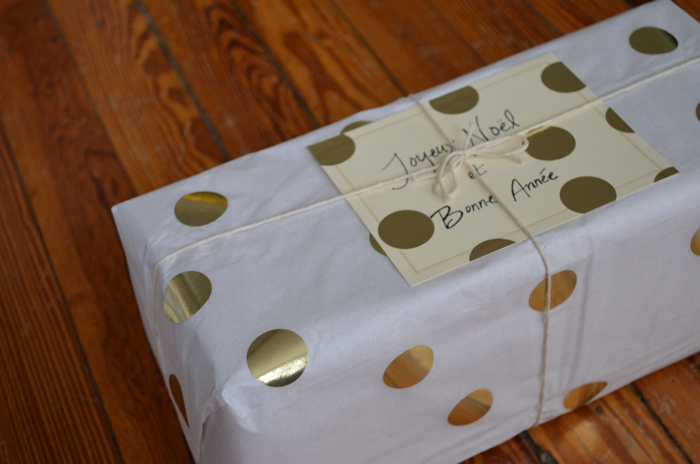 White tissue paper or brown paper work perfect with metallic dots to add a bit of shine and sparkle to presents. Then I tied it together with twine to create a touch of juxtaposition. 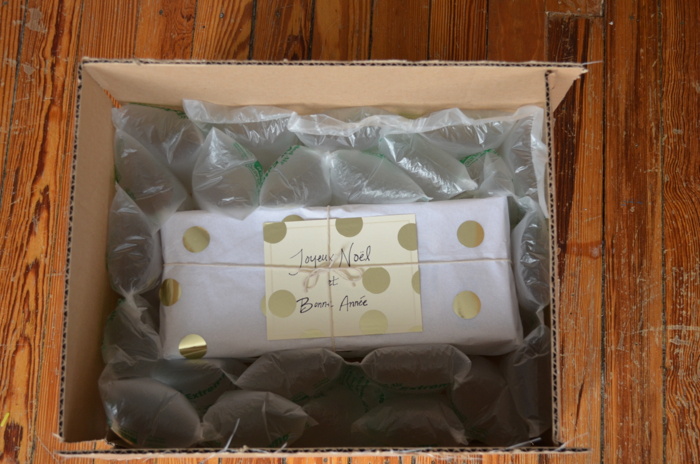 Juxtaposition in gift wrapping? Yep, it’s a thing, get on board. 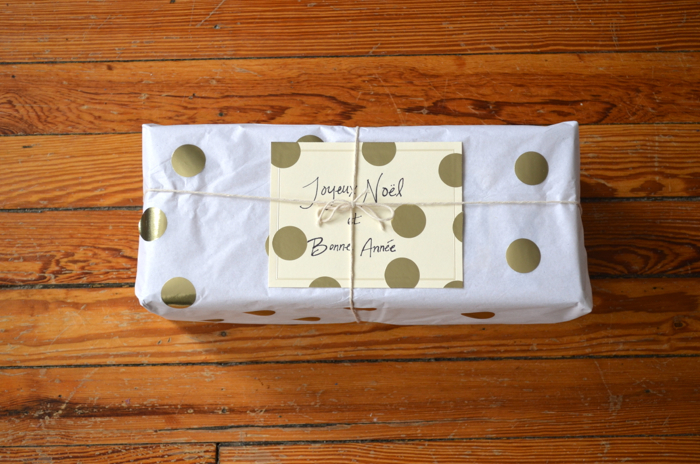 My new favorite habit, vining, is helping me to celebrate the art of gift wrapping. Tune in tomorrow for more inspiring gift wrapping ideas. I love the gold dots, by the way. With the twine. Juxtaposition!